In patients undergoing peritoneal dialysis (PD), chronic exposure to nonphysiologic PD fluids elicits low-grade peritoneal inflammation, leading to fibrosis and angiogenesis. Phenotype conversion of mesothelial cells into myofibroblasts, the so-called mesothelial-to-mesenchymal transition (MMT), significantly contributes to the peritoneal dysfunction related to PD. A number of factors have been described to induce MMT in vitro and in vivo, of which TGF-β1 is probably the most important. The vasoconstrictor peptide endothelin-1 (ET-1) is a transcriptional target of TGF-β1 and mediates excessive scarring and fibrosis in several tissues. This work studied the contribution of ET-1 to the development of peritoneal damage and failure in a mouse model of PD. ET-1 and its receptors were expressed in the peritoneal membrane and upregulated on PD fluid exposure. 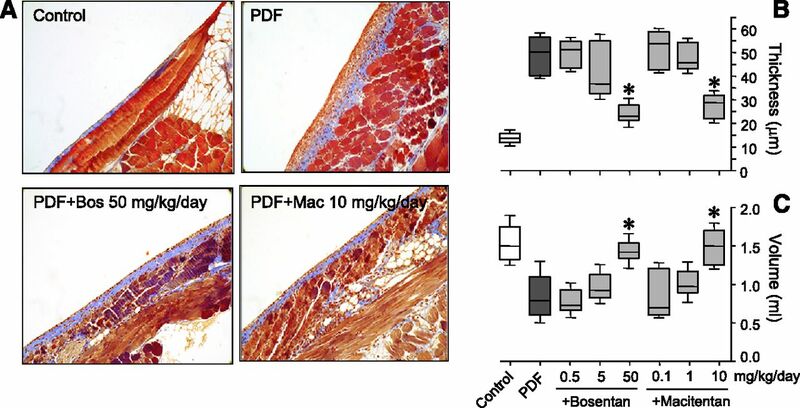 Administration of an ET receptor antagonist, either bosentan or macitentan, markedly attenuated PD-induced MMT, fibrosis, angiogenesis, and peritoneal functional decline. Adenovirus-mediated overexpression of ET-1 induced MMT in human mesothelial cells in vitro and promoted the early cellular events associated with peritoneal dysfunction in vivo. Notably, TGF-β1–blocking peptides prevented these actions of ET-1. Furthermore, a positive reciprocal relationship was observed between ET-1 expression and TGF-β1 expression in human mesothelial cells. These results strongly support a role for an ET-1/TGF-β1 axis as an inducer of MMT and subsequent peritoneal damage and fibrosis, and they highlight ET-1 as a potential therapeutic target in the treatment of PD-associated dysfunction. Several pathogenetic factors, such as inflammatory mediators, high glucose content, the presence of glucose degradation products, and low pH, can induce peritoneal mesothelial cells to lose certain epithelial characteristics and progressively acquire a fibroblast-like phenotype soon after the initiation of PD.14–17 This so-called mesothelial-to-mesenchymal transition (MMT) serves as a trigger for peritoneal fibrosis, for which overactivation of the TGF-β1 signaling has been proposed as a pathogenetic mechanism.18–22 As such, blocking the action of TGF-β1 by using several strategies has been shown to significantly ameliorate fibrosis and angiogenesis, leading to improved peritoneal function.23–27 However, because TGF-β1 is physiologically pleiotropic, nondiscriminate targeting of TGF-β1 signaling may result in undesirable side effects. Thus, the identification of potential TGF-β1 downstream targets involved in the action of this cytokine will provide more specific strategies for the preservation of the peritoneal membrane with limited secondary consequences. Several lines of evidence indicate that endothelin-1 (ET-1) may be a mediator in the development of excessive scarring and fibrosis in several organs and tissues.28,29 ET-1 is normally produced by endothelial cells, but it has been shown also to be overexpressed by fibroblasts in certain fibrotic conditions, including scleroderma and idiopathic pulmonary fibrosis.30 Recent reports, including our own work, have shown that ET-1 expression is highly induced by TGF-β1 stimulation, and like TGF-β1, ET-1 has been described to promote the epithelial-to-mesenchymal transition.31–33 Some reports have shown that ET-1 is also able to induce the expression of TGF-β1; these observations indicate the existence of reciprocal regulation of these factors in some cellular contexts.34–36 Concerning the role of ET-1 in peritoneal fibrosis, early studies have shown that volume stress stimulates peritoneal ET-1 release in PD and that increased osmolarity induces collagen type I RNA synthesis in human peritoneal mesothelial cells through a mechanism inhibited by ET receptor blockade.37,38 Nevertheless, despite the pre-eminent role of ET-1 in fibrogenesis in different pathologic contexts, the contribution of this factor to the development of PD-induced peritoneal impairment remains largely unknown. In this work, we provide evidence arising from both in vitro and in vivo models supporting a pathogenetic role for ET-1 in the PD-associated peritoneal damage. We show that the main components of the ET system, namely the ligand ET-1 and ET receptors type A (ETA) and B (ETB), were upregulated in the peritoneum on exposure to PD fluid. 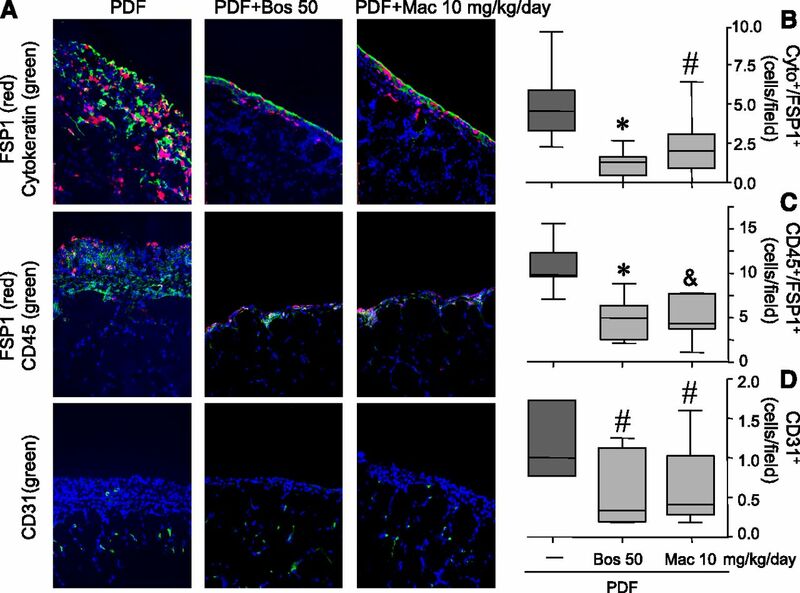 We also show that the antagonism of ET receptors by two different dual ETA/ETB blockers, bosentan and macitentan, with efficacy that has been proved in preclinical and clinical studies39,40 resulted in a marked attenuation of PD fluid-induced peritoneal membrane structural and functional alterations. Using human mesothelial cells in vitro, we found that ET-1 promoted the expression of the mesenchymal differentiation marker α-smooth muscle actin (α-SMA). This action was abrogated by TGF-β1 blockade, therefore suggesting ET-1–induced TGF-β1 expression. Reciprocally, TGF-β1 was also found to increase the expression of ET-1 in this cell model, therefore indicating the existence of a positive feedback loop between these factors to induce the differentiation process. 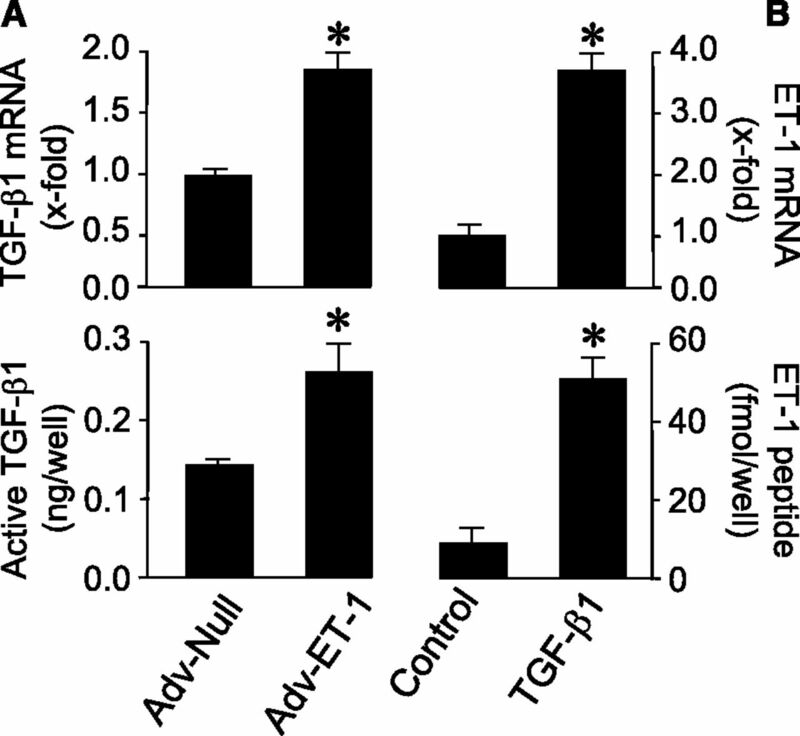 In parallel to the in vitro model, adenoviral-mediated overexpression of ET-1 in the peritoneum triggered MMT and fibrocyte recruitment, early events of PD-induced peritoneal damage, and this action was prevented by the blockade of TGF-β1 signaling. Our observations strongly support a role for ET-1 as a contributor of PD-induced peritoneal fibrosis through a TGF-β1–dependent mechanism in mesothelial cells. We initially studied the expression of the main components of the ET system, namely the ligand ET-1 and the receptors ETA and ETB, in a mouse model of PD fluid exposure.41 Immunohistochemical analysis of the parietal peritoneum of animals exposed to saline solution (control group) displayed a significant enrichment of ET-1, ETA, and ETB immunoreactivity in the outermost layer of the peritoneal membrane (Figure 1A). This staining was associated with the mesothelial cell layer, which was assessed by staining of consecutive sections with an anti-cytokeratin (mesothelial marker) antibody (data not shown). Exposure to PD fluid induced a loss of the mesothelial monolayer and the thickening of the peritoneal membrane. Interestingly, the expression of ET-1 and ETA/ETB receptors was strongly increased in the submesothelial thickened zone on exposure to PD fluid, suggesting that cells contributing to peritoneal damage and fibrosis might display enhanced ET-mediated signaling (Figure 1A). We have also analyzed the accumulation of ET-1 in the peritoneal cavity. As shown in Figure 1B, ET-1 is significantly accumulated in the effluents of PD fluid-treated mice compared with control animals, an observation that confirms the increased expression found by immunohistochemistry. ET-1 and its receptors, ETA and ETB, are expressed in the peritoneal membrane and upregulated on exposure to PD fluid (PDF) in a mouse model. Mice received through a peritoneal access port a daily 2-ml instillation of either saline (control) or standard PDF for 5 weeks. Peritoneal samples were prepared and processed for immunohistochemical analysis using specific antibodies against ET-1 and ETA/ETB receptors. (A) Representative micrographs show specific expression of ET-1 and its receptors in the outmost layer of the peritoneal membrane corresponding to mesothelial cells (MCs). Exposure to PDF markedly induced MC loss and thickening of the peritoneal membrane, events that were associated with an increased staining of ET-1 and ETA/ETB in the submesothelial compact zone. Magnification, ×400. (B) Analysis of total ET-1 peptide levels in peritoneal effluents of control and PDF-treated mice as assessed by specific ELISA. Box plot represents the median, minimum, and maximum values as well as the 25th and 75th percentiles (n=10). *P<0.05 versus control. To analyze the contribution of ET-1–mediated signaling to peritoneal damage, we tested the effect of two different dual ETA/ETB receptor blockers, bosentan and macitentan, because both receptor types were observed to be upregulated on PD fluid exposure. Administration of either ET receptor blocker reduced (in a dose-dependent manner) PD fluid-induced peritoneal thickening and preserved the mesothelium (Figure 2, A and B). Neither of the two drugs had any significant effect on control animals (data not shown). Structural alterations caused by exposure to PD fluid are associated with a reduction in the ultrafiltration capacity.23,41 Treatment with dual ETA/ETB blockers attenuated the deleterious effects of PD fluid on peritoneal membrane function (Figure 2C). Administration of ET receptor antagonists, bosentan or macitentan, dose-dependently decreases PD-induced peritoneal membrane thickness and improves filtration function. Mice were peritoneally exposed to saline (control) or standard PD fluid (PDF) containing bosentan (Bos; 0.5, 5, and 50 mg/kg per day) or macitentan (Mac; 0.1, 1, and 10 mg/kg per day) for 5 weeks. Peritoneal samples were prepared and processed for histologic analysis by hematoxylin and eosin staining. (A) Representative photographs show a significant increase in peritoneal membrane thickness on PDF exposure that was attenuated in animals treated with ET receptor antagonists (quantified in B). Magnification, ×200. (C) An ultrafiltration test was performed on the last day of treatments. Fluid volumes recovered from animals exposed to PDF were lower than the fluid volumes from mice instilled with saline solution, and an increase of net ultrafiltration was obtained in mice exposed to PDF containing increasing doses of bosentan or macitentan. Box plots represent the median, minimum, and maximum values as well as the 25th and 75th percentiles (n=10). *P<0.05 versus PDF. We then studied the effect of ET receptor antagonists on the cellular events previously described to occur in the peritoneum on exposure to PD fluids, namely MMT, fibrocyte recruitment, and increased angiogenesis.17 A characteristic histologic feature of the peritoneal membrane during PD is the accumulation of activated fibroblasts expressing fibroblast-specific protein 1 (FSP1) in the submesothelial compact zone. It has been described that the two most frequent FSP1 subpopulations are those originated from the mesothelium through MMT and from bone marrow-recruited fibrocytes.23 Thus, two-color immunofluorescence analyses with anti-FSP1 (fibroblast marker) antibody in conjunction with anti-cytokeratin (mesothelial marker) and anti-cluster of differentiation 45 (anti-CD45; panleukocyte marker expressed by fibrocytes) were performed to assess MMT and bone marrow fibrocyte recruitment, respectively. Expression of CD31 (endothelial marker) was interpreted as an indicator of angiogenesis. As shown in Figure 3A, administration of ET receptor blockers (bosentan: 50 mg/kg per day; macitentan: 10 mg/kg per day) reduced the number of Cyto/FSP1-(quantified in Figure 3B), CD45/FSP1-(quantified in Figure 3C), and CD31-positive cells per field (quantified in Figure 3D). 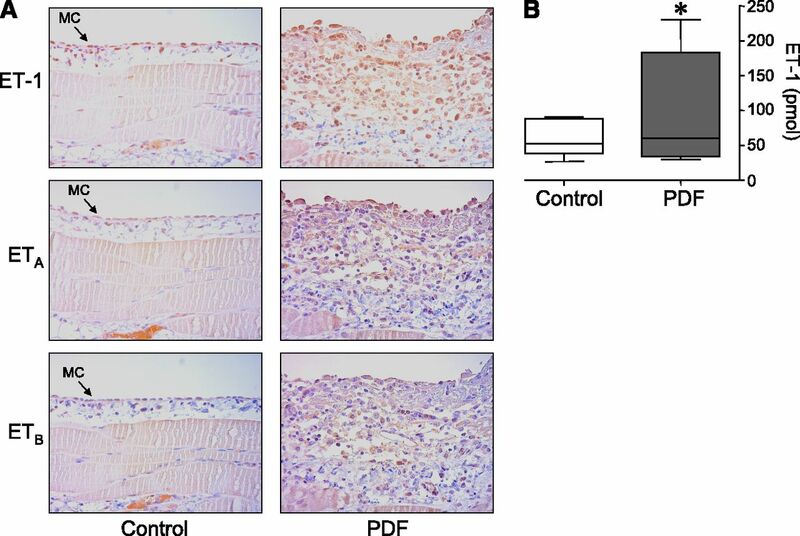 These results show that the administration of the two ET receptor blockers to mice exposed to PD fluid significantly decreases peritoneal fibrosis, angiogenesis, and accumulation of FSP1-positive fibroblasts as well as preserves membrane function. We believe that these results altogether support a role for ET-1 in the pathogenesis of PD-induced peritoneal damage. Treatment with ET receptor antagonists decreases the number of activated fibroblasts derived from mesothelial cells and bone marrow-recruited cells and reduced angiogenesis. Mice received through a peritoneal access port a daily 2-ml instillation of either saline (control) or standard PD fluid (PDF) containing bosentan (Bos; 50 mg/kg per day) or macitentan (Mac; 10 mg/kg per day) for 5 weeks. Peritoneal samples were prepared and processed for immunofluorescence studies. (A) Two-color immunofluorescence analyses with anti-FSP1 (fibroblast marker) antibody together with anticytokeratin (mesothelial marker) and CD45 (leukocyte marker) to estimate cells undergoing MMT (Cyto+/FSP1+; quantified in B) and recruited fibrocytes (CD45+/FSP1+; quantified in C) show that ET receptor antagonists significantly reduced the number of activated fibroblasts. In addition, the blockade of ET signaling decreased PD-induced angiogenesis as assessed by CD31 (endothelial marker) immunofluorescence (quantified in D). Cell counting was restricted to the submesothelial thickened zone. Box plots represent the median, minimum, and maximum values as well as the 25th and 75th percentiles (n=10). *P<0.005 versus PDF; &P<0.01 versus PDF; #P<0.05 versus PDF. To gain insight into the contribution of ET-1 to peritoneal fibrosis and damage, we investigated whether ET-1 induces MMT in vitro. For that purpose, mesothelial transdifferentiation as monitored by the presence of the mesenchymal differentiation marker α-SMA was analyzed using immunofluorescence in human omentum mesothelial cells incubated with increasing doses of ET-1 ranging from 1 to 100 nM. For comparison, TGF-β1, a cytokine shown to strongly promote MMT and peritoneal damage on application into the peritoneal cavity of mice,23 was used as a positive control (0.25–10 ng/ml). As shown in Figure 4, both ET-1 and TGF-β1 induced dose-dependent increases in the expression of α-SMA. Additionally, we infected mesothelial cells with adenoviruses for the overexpression of ET-1 and TGF-β1. Figure 4 also shows that, similar to the ligands, both adenoviruses upregulated the expression of α-SMA. 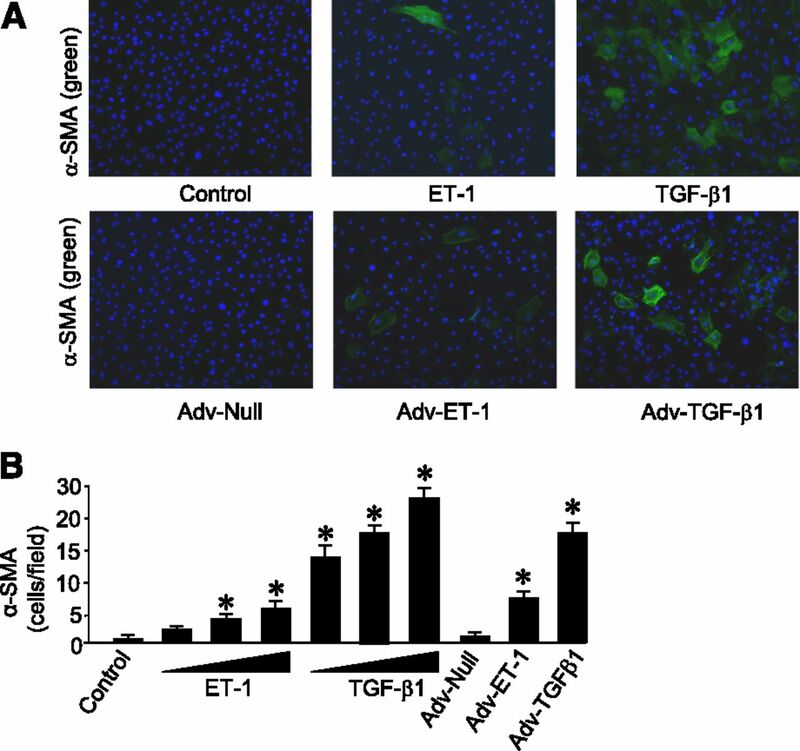 Adenoviral-mediated overexpression of ET-1 and TGF-β1 promotes the acquisition of the mesenchymal marker α-SMA in mesothelial cells isolated from human omentum. Human mesothelial cells in culture were incubated with increasing doses of ET-1 (1, 10, and 100 nM) or TGF-β1 (0.25, 2.5, and 10 ng/ml) or infected with ET-1–(Adv-ET-1) or TGF-β1–overexpressing adenovirus (Adv-TGF-β1; 2×109 plaque-forming units/ml) for 24 hours, and the expression of α-SMA was analyzed by immunofluorescence. A shows representative photographs obtained with 100 nM ET-1, 10 ng/ml TGF-β1, or the corresponding adenoviruses (quantified in B). (B) Values are represented as the number of α-SMA+ cells per field with respect to values for control (Adv-Null; mean±SEM; n=6 from three different cell preparations). *P<0.01 versus control. We then examined whether there exists a reciprocal regulation in the actions of ET-1 and TGF-β1 on the induction of α-SMA expression in mesothelial cells by using the ET receptor antagonist bosentan and the TGF-β1–blocking peptide P17. As shown in Figure 5, whereas bosentan was able to inhibit the action of ET-1 but not that of TGF-β1, P17 peptide blocked the responses induced by both stimuli. These results indicate that TGF-β1 is involved in the action of ET-1 on α-SMA expression. TGF-β1 signaling blockade abrogates ET-1–induced α-SMA expression. Human mesothelial cells in culture were infected for 24 hours with ET-1– (Adv-ET-1) or TGF-β1–overexpressing adenovirus (Adv-TGF-β1; 2×109 plaque-forming units/ml) in the presence of the ET receptor antagonist bosentan (bos; 10 μM), the TGF-β1–blocking peptide P17 (150 μg/ml), or its corresponding control peptide (CP), and the expression of α-SMA was analyzed by immunofluorescence (A shows representative photographs; quantified in B). Values are represented as number of α-SMA+ cells per field with respect to values for null adenovirus (mean±SEM; n=6 from three different cell preparations). *P<0.01 versus control (Adv-Null); #P<0.05 versus Adv-ET-1; &P<0.05 versus Adv-TGF-β1. We then investigated whether ET-1 is able to promote enhanced expression of TGF-β1. For that purpose, human mesothelial Met5A cells were infected with adenoviruses overexpressing ET-1. As shown in Figure 6A, ET-1 overexpression induced significant increases in TGF-β1 mRNA levels, which were associated with augmented accumulation of active TGF-β1 in the cell supernatants as assessed with the mink lung epithelial TGF-β reporter cell line.42 We have also studied whether ET-1 expression is regulated by TGF-β1 in Met5A cells. Figure 6B shows that treatment with the growth factor induced the expression of ET-1 mRNA and the accumulation of ET-1 peptide in the extracellular medium, thus indicating that a reciprocal relationship indeed exists for the control of the expression of these factors in mesothelial cells. Reciprocal relationship for the control of the expression of ET-1 and TGF-β1 in human mesothelial Met5A cells. 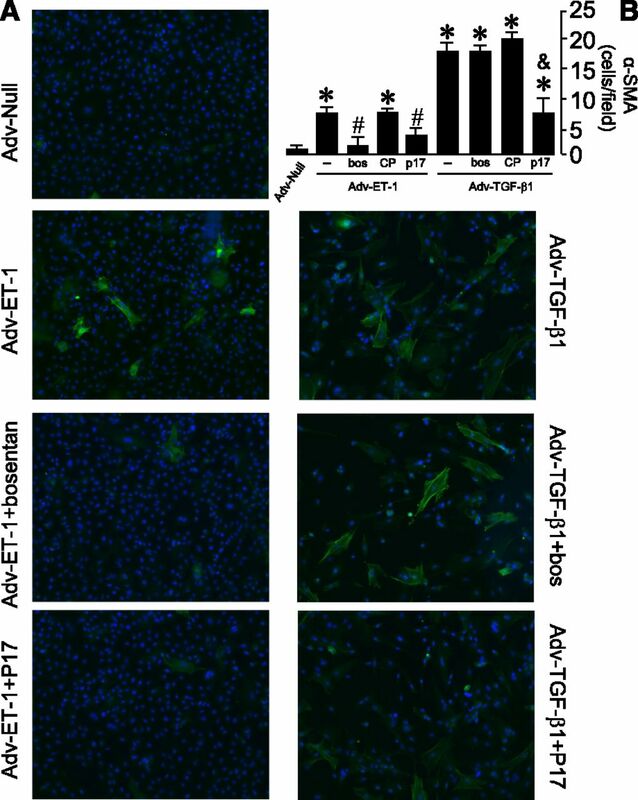 (A) Adenoviral-mediated overexpression of ET-1 (Adv-ET-1; 2×109 plaque-forming units/ml) induced significant increases of TGF-β1 mRNA levels (upper panel) and active TGF-β1 (lower panel). (B) Ten nanograms per milliliter TGF-β1 induced increases of ET-1 mRNA (upper panel) and ET-1 peptide (lower panel). TGF-β1 and ET-1 mRNA levels were determined by quantitative PCR, whereas active TGF-β1 and ET-1 peptide accumulation in cell supernatants was quantified by using the mink lung epithelial TGF-β reporter cell line and specific ELISA, respectively. Values are represented as fold induction (x-fold; mRNA) and nanograms or femtomoles per well with respect to values for null adenovirus or control in the absence of TGF-β1 (mean±SEM; n=6). *P<0.05 versus control (Adv-Null). To verify whether this ET-1/TGF-β1 regulatory axis occurs in vivo and contributes to peritoneal dysfunction, ET-1–overexpressing adenoviruses were directly applied into the peritoneal cavity of mice. As shown in Figure 7, ET-1 overexpression was able to induce in vivo the early cellular events associated with peritoneal damage on exposure to PD fluid. ET-1 at 12 days, but not at 4 days, induced a late-onset MMT, which was clearly detected as an increased number of Cyto/FSP1-positive cells per field, as well as promoted the recruitment of circulating fibrocytes, which was assessed by detection of FSP1/CD45-positive cells. However, ET-1 (up to 12 days) was unable to stimulate angiogenesis as visualized by the endothelial marker CD31. Consistent with in vitro experiments, ET-1–induced MMT and fibrocyte recruitment were significantly prevented by the application of the TGF-β1–blocking peptide P144, which was deemed more suitable for in vivo experiments, hence indicating that ET-1 exerts its action through TGF-β1. 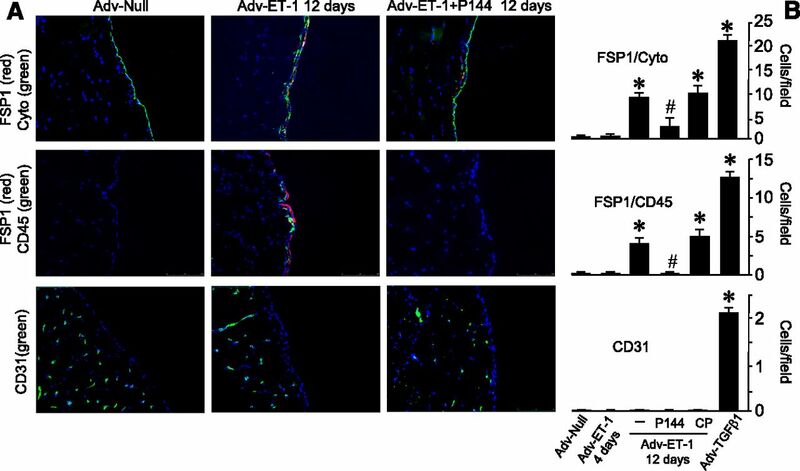 Adenoviral-mediated overexpression of ET-1 (Adv-ET-1) in vivo induces the early events of PD fluid-induced peritoneal damage and fibrosis. ET-1–overexpressing adenoviruses were applied into the peritoneal cavity of mice (100 μl suspension containing 1×108 plaque-forming units), and the extent of MMT, fibrocyte recruitment, and angiogenesis was estimated by double immunofluorescence after 4 or 12 days of treatment. Mice treated with TGF-β1–blocking peptide P144 or its corresponding control peptide (CP; 4 mg/kg per day diluted in 1 ml saline) were injected intraperitoneally every day. (A) Representative photographs for MMT (FSP1/Cyto), fibrocytes (FSP1/CD45), and angiogenesis (CD31) staining are shown for control (Adv-Null) and Adv-ET-1 12 days with or without the treatment with P144 peptide. (B) Number of double-positive FSP1/Cyto (top panel), FSP1/CD45 (middle panel), and CD31 (bottom panel) cells per field for mice treated with ET-1 (4 and 12 days with P144 or CPs) as well as TGF-β1–overexpressing adenovirus (Adv-TGF-β1; 4 days) for comparison purposes. Cell counting was restricted to the submesothelial thickened zone. Compared with TGF-β1, which was able to induce a strong response of the whole set of cellular events as soon as 4 days of treatment, 12 days of ET-1 overexpression promoted a moderate MMT and fibrocyte recruitment response that was significantly attenuated by TGF-β1 signaling blockade (mean±SEM; n=10) in the absence of significant angiogenesis. *P<0.01 versus Adv-Null; #P<0.05 versus Adv-ET-1 12 days. From a clinical perspective, together with the development of more biocompatible fluids that better preserve the mesothelial cell monolayer, the specific blockade of the TGF-β1 signal transduction pathway may provide an interesting therapeutic approach. Nevertheless, the use of TGF-β1–blocking small molecules is unacceptable because of its important modulating functions of the immune and inflammatory responses. Gene-tailored approaches proven to have an effect on TGF-β1 expression and/or activity directly in the peritoneum might represent options for the clinical intervention. On the basis of the results of this work, the blockade of the ET-1 signaling by the use of specific antagonists may fulfill this requirement. The addition of ET receptor antagonists to the PD fluid may, therefore, provide protection from the deterioration of the mesothelial membrane. To this respect, bosentan (Tracleer) is currently indicated for the treatment of pulmonary arterial hypertension and has shown its antifibrotic properties in reducing the number of new digital ulcers in patients with systemic sclerosis, a prototypic fibrotic disorder.47–49 However, macitentan (Opsumit) has been developed as an improved dual ET receptor antagonist that has been recently approved for the treatment of pulmonary arterial hypertension and is also under study for systemic sclerosis-associated digital ulcers.39,50 In vitro, macitentan has been recently described to reduce the profibrotic response of dermal fibroblasts from systemic sclerosis patients.51,52 It should be, however, noted that these drugs have shown significant side effects that have so far hampered their use as a general antifibrotic therapy.29 This fact, together with the observation that PD fluid-associated complications develop in the long term, raises concerns about the widespread use of these drugs against functional deterioration of the peritoneal membrane. It is, therefore, mandatory to carefully design and perform a corresponding clinical trial, which as a first approach, may be focused on a subset of renal patients already displaying signs of membrane deterioration. Additional studies are, thus, needed to unequivocally show whether these drugs may be safely translated to the clinical practice of patients receiving PD. In conclusion, we report here that ET-1 plays an important role as an inducer of the process of MMT and subsequent peritoneal damage and fibrosis and show a causal role for TGF-β1 in the actions of ET-1 on the peritoneum. Our observations that the administration of ET receptor blockers significantly reduced the peritoneal thickness and preserved the mesothelium and the filtration function in the mouse model of PD fluid exposure also support the notion that ET signaling antagonism may represent a useful strategy for the treatment of PD complications. Female C57BL/6 mice between 12 and 16 weeks of age were used in this study (Harlan Interfauna Iberica, Barcelona, Spain). The experimental protocol used was in accordance with the National Institutes of Health Guide for Care and Use of Laboratory Animals and approved by the Animal Ethics Committee of the Centro de Biología Molecular “Severo Ochoa.” PD fluid or saline solution was instilled by a peritoneal catheter connected to an implanted subcutaneous miniature access port (Access Technologies, Skokie, IL) as described previously.23,41 Through this device, animals received either saline solution (control) or standard PD fluid composed of 4.25% glucose and buffered with lactate (Stay Safe; Fresenius, Bad Homburg, Germany) either alone or containing bosentan (0.5, 5, and 50 mg/kg per day) or macitentan (0.1, 1, and 10 mg/kg per day) for 5 weeks. Potential systemic side effects of ET receptor antagonists bosentan and macitentan, such as fluctuations in BP or edema, were not monitored. Ten animals per experimental group entered the experiment, and all completed the trial. The peritoneal filtration capacity was analyzed by an equilibrium test during the last day of treatment as previously described.23 Parietal peritoneum samples were obtained from the contralateral side of the implanted catheter for standard histologic and immunofluorescence analyses. Antibodies used were from Thermo Fisher Scientific (Waltham, MA): anti–ET-1; Santa Cruz Biotechnology (Santa Cruz, CA): anti-ETA receptor, anti-ETB receptor, and anti-pancytokeratin; Abcam, Inc. (Cambridge, UK): CD31 (platelet endothelial cell adhesion molecule); Dako (Glostrup, Denmark): FSP1; and BD Biosciences (East Rutherford, New Jersey): CD45 (protein tyrosine phosphatase, receptor type C). ET-1 levels in peritoneal effluents were determined by specific ELISA according to the manufacturer’s instructions with slight modifications (Endothelin-1 Quantikine ELISA Kit; R&D Systems). Peritoneal effluents were solid phase-extracted using Sep-Pak C18 cartridges (EMD Millipore, Billerica, MA) and assayed using ET-1 peptide as standard (Merck EMD, Darmstad, Germany). Detection limit under our experimental conditions was estimated to be 2.5–4 pmol/sample. Omentum-derived and Met5A cells were treated for 24 hours with ET-1 (1–100 nM), TGF-β1 (0.25–10 ng/ml), or ET-1– and active TGF-β1–overexpressing adenoviruses in the presence or absence of the ET receptor antagonist bosentan (10 μM), TGF-β1–blocking peptide P17 (150 μg/ml), or its corresponding control peptide. Omentum-derived mesothelial cells were used for immunofluorescence analysis of the expression of the mesenchymal marker α-SMA. Cells were fixed in 4% formaldehyde in PBS for 10 minutes and then permeabilized with 0.2% Triton X-100 in PBS for 5 minutes at room temperature. Cells were washed with PBS, blocked with 1% BSA in PBS for 1 hour, and then incubated overnight at 4°C with an anti–α-SMA antibody (Master Diagnostica, Granada, Spain) followed by the corresponding fluorescent secondary antibody. Cell fluorescence was visualized by microscopy with a Nikon Eclipse T2000U (Nikon, Amstelveen, The Netherlands). Images were analyzed by computerized digital image analysis (NIS-Elements Imaging Software; Nikon). Experiments requiring a higher number of cells, such as ET-1 and TGF-β determinations and RT-PCR analysis, were done with Met5A cells. For RT-PCR studies, total RNA was isolated by guanidium thiocyanate/phenol/chloroform extraction, cDNA was synthesized using an iScript cDNA synthesis kit, and quantitative PCR for the detection of TGF-β1 mRNA expression was performed using iQ SYBR green Supermix and primers as previously described (Bio-Rad, Hercules, CA).60 Sequences of primers were as follows: human TGF-β1 forward: ACCTGAACCCGTGTTGCTCT; human TGF-β1 reverse: CTAAGGCGAAAGCCCTCAAT; human glyceraldehyde-3-phosphate dehydrogenase forward: CCCATGTTCGTCATGGGTGT; human glyceraldehyde-3-phosphate dehydrogenase reverse: TGGTCATGAGTCCTTCCACGATA. Human ET-1 mRNA expression was determined using TaqMan Assay (EDN1, Hs00174961_m1; Life Technologies, Carlsbad, CA). Active TGF-β1 in cell culture supernatants was estimated by the use of the mink lung epithelial TGF-β reporter cell line stably transfected with a reporter construct of the human plasminogen activator inhibitor-1 promoter fused to luciferase (provided by Daniel B. Rifkin).42 Cell supernatants from Met5A cells infected with either ET-1 or null adenoviruses for 24 hours in the absence of serum were transferred to TGF-β reporter cells seeded into 24-well tissue culture plates. After overnight incubation, cells were lysed and luciferase activity-assayed using the Luciferase Assay System (Promega, Madison, WI). Active TGF-β1 levels were calculated by calibration with a recombinant TGF-β1 standard curve. Endothelin-1 Quantikine ELISA Kit was also used to determine ET-1 levels in cell supernatants. For in vivo experiments involving the overexpression of ET-1 and TGF-β1, mice were intraperitoneally injected with 100 μl suspensions containing 1×108 plaque-forming units of the corresponding adenoviruses as previously described.23 Animals treated with P144 peptide or its corresponding control peptide (4 mg/kg per day diluted in 1 ml saline solution) were injected intraperitoneally every day (with the exception of the days that adenovirus was applied). Four or twelve days after the injection, animals were euthanized, and the parietal peritoneum was collected for immunofluorescence analysis. Results are presented as 25th and 75th percentiles; median, minimum, and maximum values in box plot graphs; or means±SEMs in bar graphs. The data groups were compared with the nonparametric Mann–Whitney rank sum U test and Wilcoxon signed rank test for in vivo and in vitro studies, respectively (Prism version 4.0; GraphPad, La Jolla, CA). P<0.05 was considered statistically significant. Actelion Pharmaceuticals Ltd. supplied the endothelin receptor antagonists bosentan and macitentan. Actelion Pharmaceuticals Ltd. had no role in the study design, collection, analysis, or interpretation of the data, or writing the manuscript. Actelion Pharmaceuticals Ltd. has not revised the content of the submitted manuscript or made decisions on the approval of the publication of the article. J.D. is an employee of Digna Biotech. We thank Macarena Quesada, Eva M. Blanco, and Jorge García for their technical assistance.